Traveling with diabetes is never exactly easy! I think diabetes should count as another person because of all the supplies that you obsessively over pack need for your trip! We are, by no means, travel experts. We do, however, travel somewhat frequently. So I thought I would share what we do and how we pack it all! Most of our travel is done by air. We travel by car a couple times a year. These trips are about 5 hours in length - so really not all that far considering. We travel by air at least 3-4 times a year. We've used smaller, more regional airports and we've used large airports like Reagan, Orlando, Atlanta, and Tampa. As always, this is what we do and what works for us. I'm fond of the saying, "Whatever floats your boat". But I heard a good one the other day - "Whatever makes your dress fly up!" So, you know, if this works for you, too - cool. If not... cool. Packing for the trip can be pretty stressful. We've got it down to a science now and we know exactly what we need. But at first, when diabetes was still so new... it was scary. I was so afraid that I would forget something vital at home. Here's the thing I've learned - we never travel to the back country of Africa or anything like that. We are always close to a Walgreens or some other pharmacy. We get our supplies (most of them) from Walgreens. They are so awesome (They are so awesome! They even sent us a Christmas card this year! Which means between A's diabetes meds and J's heart meds and my allergy meds - we are there waaaayyy too often. We don't even have to tell them our names. In fact, last time she told us we needed our own bin for all our stuff. Yikes. But seriously - it's kind of comforting that they "know" us...). I know they can order or call the doctor for anything we would need. I also know I can call our endo clinic and they will hook us up. And I know for things I can't get like that - there's the amazing DOC. Put out a cry for help and someone will be able to hook you up. That's pretty comforting, too! 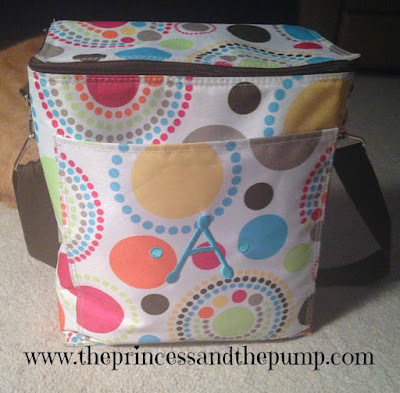 Our diabetes supply bag for traveling is the picnic thermal from Thirty One. There are a couple of reasons why I love this bag for this purpose. 1. It's not too big and not too small. 2. It has a nice strap that makes lugging it through the airport easier. 3. We can smush it into another carry on for the plane if needed. Or leave it out. 4. It's a thermal bag. So when we get where we are going, we can use it as a thermal if needed. We are usually gone anywhere from 7-14 days and this bag fits aaaalllll of our stuff. And I pack a ton. I want to make sure I have enough! So I always pack way more than I need. I pack boxes of strips (again - way more than I need), a back up meter and strips, and an extra lancing device. I leave all the stuff she uses each day in her regular supply kit. Sometimes I put it on top of this bag and sometimes I throw it in my purse. Just depends. I pack Dexcom sensors - again, way more than I need. I also pack the Opsite Flexifix we use to tape down Dex (that's the stuff in the baggie that almost looks like a roll of graph paper - LOVE it. ), a tube of numbing cream (because we still use it - even though she doesn't NEED it, she likes to have it. It's all mental. But if it makes her feel better, I'm down with that. That's not to say we leave it on the 30 minutes or whatever it says... Just having it on is all she needs. 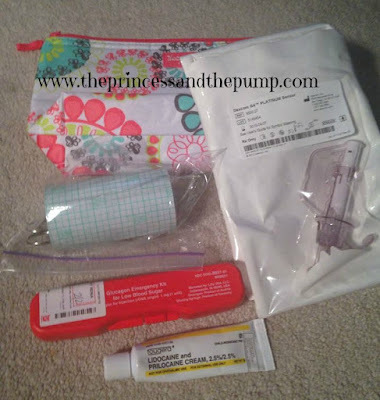 ), and extra glucagon and a mini thermal pouch. The mini thermal is also from Thirty One and that's where we put our insulin with a freezer pack. This is just a little wallet thing that I used to use. 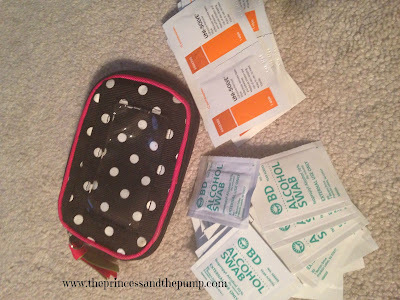 It's the perfect size for the alcohol wipes and adhesive remover wipes. This is another of my many bags. 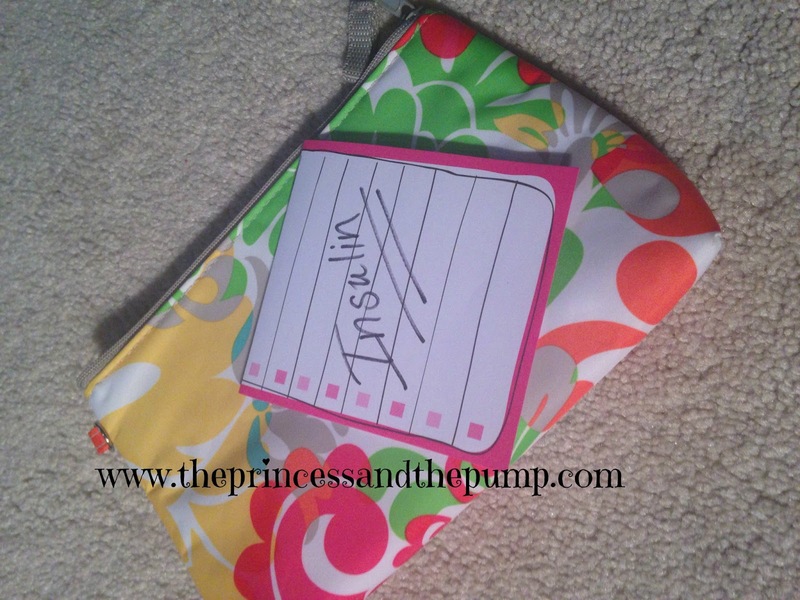 This one is Vera Bradley. I put the Teagaderm adhesive in there (we use the Tag to cover the numbing cream.) Also in this pouch are extra batteries for the meters and for the Omnipod PDM, syringes - just in case, and extra low treats. Not pictured are the boxes of Omnipods. I leave them in the box (I sometimes grab a whole box of Dex sensors, too - depending on the length of our trip.). One nice thing about Omnipod is that it's all in one! But if you're using different pump, then you need all tubing and reservoirs and stuff. When we were using a tubed pump, I just grabbed another bag for that stuff. This sits out on the kitchen counter with the bag so we don't forget the insulin!!! So that's WHAT we pack and what we pack it all IN! * Juice Boxes - We used to add those to our supply bag when flying. This caused the most problem out of ANYTHING. Some places didn't care when we said it was part of her medical supplies. Some places acted like it was poison and patted us down. We finally decided it wasn't worth the hassle. If she really needs juice we can get it once we get through security. But honestly, she's fine with the other stuff for a flight. * We have a note from our endo saying that she needs all these supplies, yada, yada, yada. We keep it in that exterior pocket. We used to get one each time we went somewhere. But not once in six and half years has anyone, in any sized airport, ever asked to see it. We just carry around an old one in case. * We usually get all our stuff on the conveyor to go through x-ray and then say to one of the workers standing there - "This bag has medical supplies in it." That's it. They've never searched it. Never even paused over it. Unless there were juice boxes inside! * The picnic thermal and all those supplies I was talking about is a carry on bag. We do not check ANY of our diabetes stuff. As I mentioned, we can put that bag inside of a larger carry on if needed. I know this may not be possible if you have more than one person with diabetes in your family. My suggestion would be to pack as much as you can in a carry on bag and then maybe put your extras in a checked bag for "just in case". * We always go through the metal detector and not the full body scanner. They just send us there - probably because A is a child. And I always go right behind her. Sometimes J has to go through the whole body thing and sometimes he doesn't. * I never mention that she is wearing an insulin pump. Or a cgm. It never beeps. She just goes through and that's that. Another awesome feature of the Omnipod! * Back when she had a tubed pump we sometimes took it off and sometimes didn't. Sometimes they would swab it or her hands or both. Sometimes I had to get swabbed and patted down, too. Which was ridiculous when she was only 3... but then people are ridiculous about doing horrible things and I'd rather the security take precautions. I will say that everyone we ever encountered was super nice to A. It would make her nervous and they would go out of their way to make it as easy as possible. I know some people will ask to pass the tubed pump around the metal detector. That's up to you... It's been so long since we did that I'm out of practice there! * Sometimes she wears her Dex receiver through the metal detector and sometimes it's in my purse. Again, we never mention it. * Confession - although you are probably technically supposed to turn Dex off during flight (and that probably goes for the Animas remote and the Omnipod PDM) - we do not. We leave it on. Same for the PDM. * I will often set a temp basal increase for travel. Especially when traveling in the car - but we also find when flying, she needs some extra basal because in everyday life she does not ever sit still for two hours - let alone five. * Some folks have encountered post flight lows. You can read more about that from my friend Melissa here. She did some awesome research! For us, this does not happen. Maybe it's because she uses the Omnipod.... I don't know. But I can tell you that for whatever reason, she's not low after a flight. She's usually on the high side. Could be her pump. Could be excitement. Could be the lack of movement for an extended period. Could just be a weird thing that is just her. But - you should read Melissa's blog just in case! * We don't over share. I've mentioned this before - and, of course, this is totally up to your comfort level. But we don't tell the nice people at security and elsewhere that she has diabetes or is wearing devices and things like that. I imagine it's easier for a child to pass through without a second glance. But we used to tell them she had on a pump or cgm before she went through the metal detector or explain what was in the supply bag, etc. And then we realized that they didn't care. This has been pretty consistent whether in was a huge airport in Washington DC or a small, regional airport in Sarasota. (Although, for the record, Sarasota has been the pickiest of all - especially with those darn juice boxes!) Now we don't say it's diabetes supplies, we don't tell them who has diabetes and we don't point out any of the devices on her body. Nothing beeps. No one asks us. And we're on our way. * Random learning: We recently went to Disney. It was HOT. 98 degrees with 98% humidity. 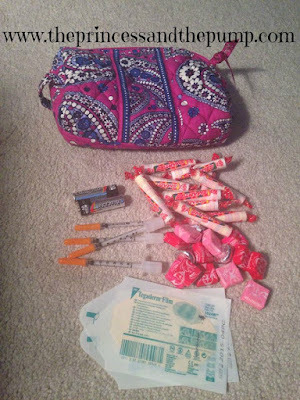 The day we checked out we left our diabetes supply bag with the concierge while we went to the park. We thought this was better than putting it in a hot car all day. When we got our stuff, it had not been in the air conditioning as we had thought. You could feel the heat radiating from the bags. We were not headed home - just to the beach for another week. I was worried about our supplies. Especially the pods. But everything was fine. While I don't recommend doing this, the heat didn't seem to bother any of the supplies. So if it happens, don't freak out! It may not be a disaster! * THIS IS WHAT WORKS FOR US! THIS SHOULD IN NO WAY BE TAKEN AS MEDICAL ADVICE!!! Sorry, didn't mean to shout. I just want to make sure you get that just because we do it this way does NOT mean that you should do it this way. You've got to go with your gut and use your head because no one knows your body or your child's body like you! I simply wanted to share what we pack and what I've learned in case someone might be interested! But you know... whatever butters your biscuit! I used to get pretty uptight when we traveled wondering if diabetes was going to cause all kinds of issues with security and traveling. But now, we honestly don't even think twice about it. In our experience, it has always been pretty easy! Don't let diabetes hold you back from anything - especially traveling!! Go wherever you want to go - and just take diabetes along for the ride! 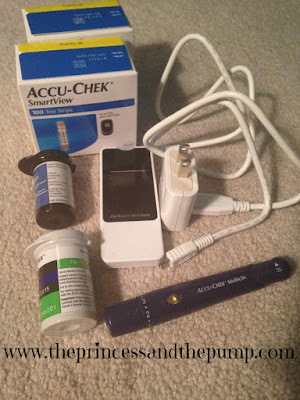 I note that you are using an Accu-Chek meter and strips, while I believe the OmniPod system's PDM takes Freestyle strips. 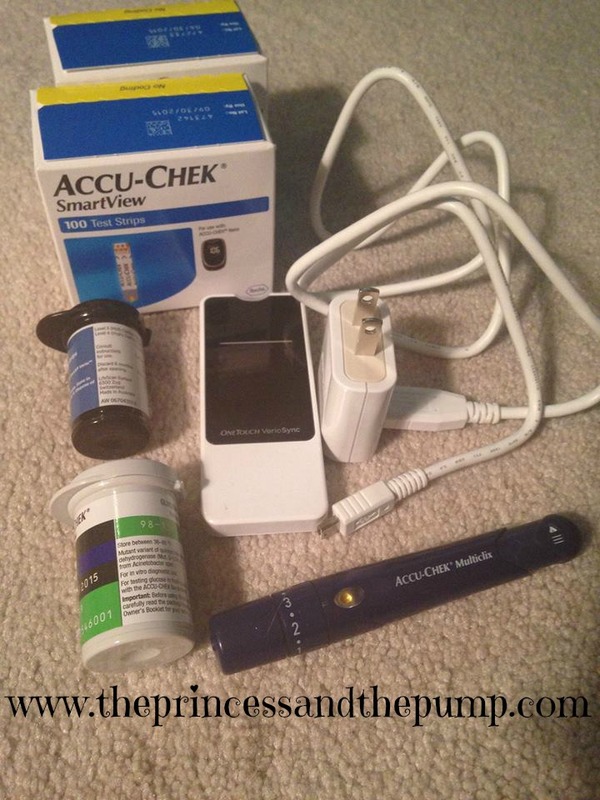 Is there a reason why you're using Accu-Chek? Also, I was on the OmniPod YEARS ago and experienced a lot of Pod failures. May I assume that the newer-fangled ones are more reliable? Thank you for this post. I've been sitting here for the past couple of hours freaking out about my upcoming trip, how to pack my diabetes supplies, what to do with the pods, etc, and it really helps to see it written that it doesn't have to be as bad as what I'm imagining it to be.